Photo courtesy of Colleen Beck. Through her work in international development, Colleen Beck witnessed how people utilize water to grow food around the globe in Kenya, China and Thailand. Returning to Pennsylvania, she was asked to research an aquaponics system for the faith-based NGO, MTEC International, which does international mission work. After creating two custom systems, she decided to launch Seed Aquaponics LLC in December 2014 and take the business global, seeing aquaponic farming as an “obvious solution” to managing water use in agriculture. Beck says that she was drawn to aquaponic farming because of the efficiency of the practice. Food can be grown twice as fast as conventional methods, using 90 percent less water. By nature, aquaponic farming is also organic. Any chemicals in the water would kill the fish, not to mention the systems eliminate the risk of water contamination from sewage, floods or runoff. Seed Aquaponics designed its systems to be versatile: they can be used in diverse climates, and customers choose the species of plants and fish they wish to grow. For example, in cold climates, cold-water fish can be grown to conserve energy. The customers using Seed Aquaponics systems vary too, ranging from backyard gardeners to urban farmers in American cities to community leaders in small villages around the world. Seed Aquaponics sells two types of beds: raft and media. Raft beds are equipped to grow lightweight plants such as herbs and lettuce. Media beds accommodate deeper-rooted plants like tomatoes. Both models are customizable and scalable to the needs of the customer. Beyond the ecological and structural advantages, Beck views aquaponic farming as an opportunity for education—both about the systems themselves and the cultures and communities who use them. The largest project Seed Aquaponics has undertaken so far was in conjunction with Allegheny College. 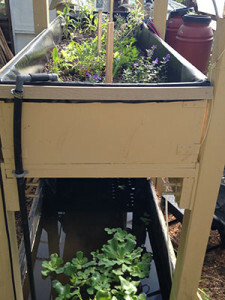 Students received academic credit for learning how to construct aquaponic systems in Thailand. “But more than that,” Beck says, “we got to be involved with the community and got a sense of [the] culture while visiting the schools, restaurants, wildlife sanctuaries and temples. It was truly a challenge that changed all of our lives for the better.” Slippery Rock University and Seed Aquaponics have a similar trip planned for next year in Uganda. As for the future, Beck says that Seed Aquaponics is working with engineers to develop a shippable and expandable farming system to enable customers to enlarge their systems in a modular fashion, making installation easier and less expensive as well. During its early stages, Seed Aquaponics received considerable support from the community. The business initially received an InterSector Grant from the Pittsburgh-based social enterprise accelerator Idea Foundry to cover the initial costs of demonstration systems, advertising and legal, logistical and budgetary advising. Beck says that Seed Aquaponics has become a profitable company in large part due to the mentorship of the Idea Foundry and The Duquesne University Small Business Development Center, which provided additional startup support. Local engineers and environmentalists have also volunteered guidance and assistance to help Seed Aquaponics make its way as a fledgling company. Besides the communities she has worked with abroad, Beck says her own community in Pittsburgh “has responded warmly to aquaponics.” Healcrest Urban Farms, a Pittsburgh-based urban farm growing tea and herbs, utilizes a Seed Aquaponics vertical growing systems in one of its communal spaces.